Hello and welcome! Before I get to today's post I wanted to say Thank You to everyone that stopped by and commented on my 12 tags blog post. Ok so this week over on the Simon Says Stamp Monday Challenge Blog the design team wants to see how we use citrus with a twist. 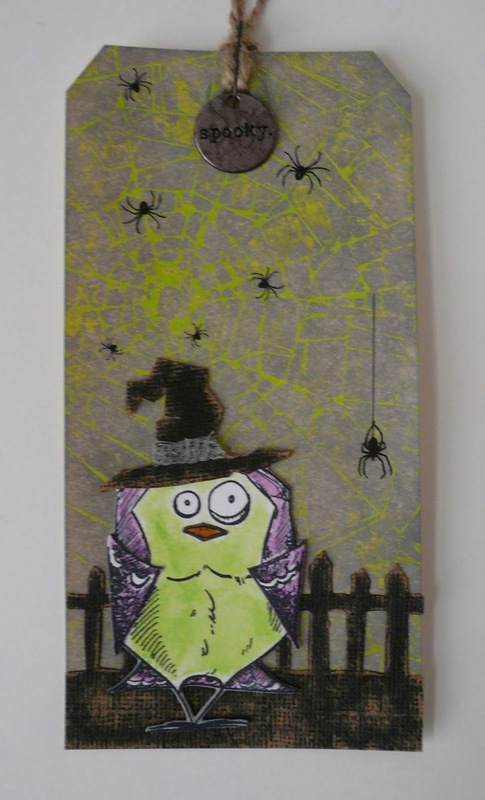 First thing that popped into my head was to create a Halloween themed project using my Tim Holtz Twisted Citron Distress products. I started by creating a monoprint using Twisted Citron Distress Paint and the Shatter Layering Stencil. I then covered the tag with Hickory Smoke Distress Ink and applied a bunch of spiders using the Curiosities Remnant Rubs. Next I stamped one of my favorite birds from Bird Crazy onto Distress Watercolor Cardstock and colored with Distress Markers. I used the new Bird Crazy Thinlits Dies to cut out the bird, his wings and beak. For the witch hat I was inspired by this tutorial by Tammy Tutterow. Before adhering the bird to the tag I attached the fence that I cut from Kraft-Core Cardstock using the On the Fence Die. I finished this twisted tag with some Jute String and a Oddities Token on a Loop Pin. Thanks so much for stopping by!